Please complete the sign up form below to register for the scramble. We look forward to seeing you soon! This information is how we will organize your team location the day of the tournament. Are you purchasing an entry fee for anyone other than yourself? Great! Just enter the name and email address of each player you are purchasing an entry fee for, and purchase the correct amount of entree fees below before checking out. 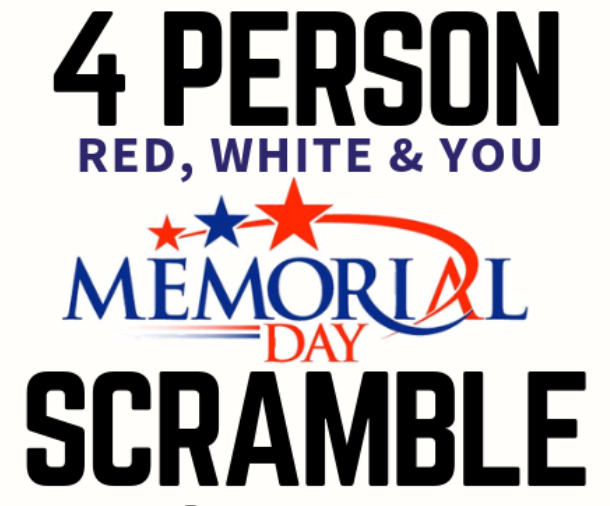 Purchase your entry fee now for the Red, White & You Scramble! Saturday, May 18th at 9:00am. $44.95 entry fee includes Golf, Cart, Breakfast, Lunch, Logo Golf Chip, and Range Balls. Raffle tickets available at tournaments! Raffle ticket proceeds will be used for prizes drawn after the event!